Justice Ayotunde Faji of a Federal High Court in Lagos on Friday convicted and sentenced a 24-year-old man to 24 months imprisonment for smuggling marijuana otherwise known as Indian hemp to the kirikiri prison, PM Express reports. 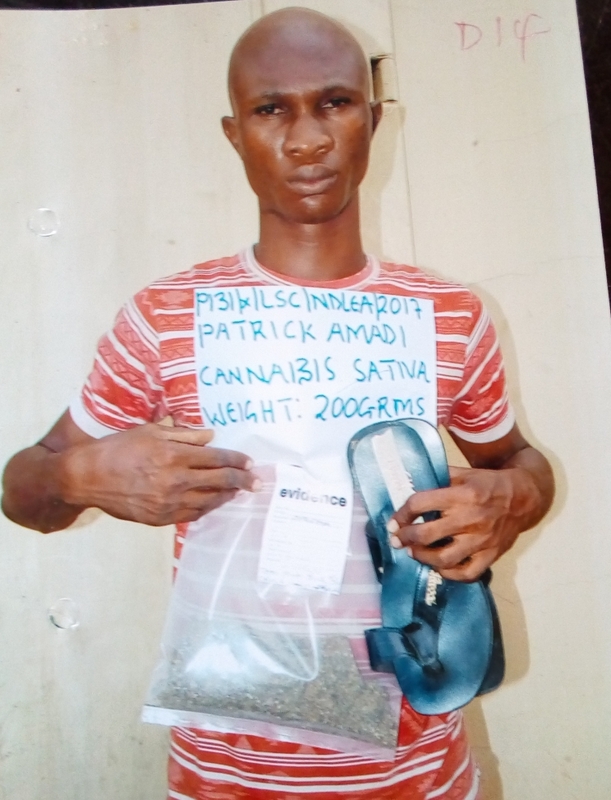 The court heard that the convict, Patrick Amadi, hid the marijuana in his sandal and gave to his brother who is serving a jail term at the Kirikiri prisons, Lagos. The National Drug Law Enforcement Agency (NDLEA), had arraigned him before the court on a one count charge of dealing in narcotic and he pleaded guilty to the charge. The convict was arrested on June 18, 2017, at Kirikiri Maximum Prisons, with 200 grammes of Cannabis Sativa, also known as marijuana, the NDLEA prosecutor, Mr. Jeremiah Aernan, told the court. According to Aernan, the prison’s officials who arrested the convict, said he hid the said banned weed in a pair of sandals, which he wore when he visited his brother who is serving jail term at the facility. He added that the offence committed by the convict, is contrary to and punishable under section 11(c) of NDLEA Act Cap. N30, laws of the federation of Nigeria, 2004. However, Amadi, pleaded with the court to temper justice with mercy in sentencing. He said, he had become remorse since he was arrested, and promised not to engage in crime again. In his judgment, Justice Faji, sentenced him to 24 months imprisonment and admonished him to use his jail period to turn a new leaf. Azeez was sent to prison on Friday, after he was arraigned before the court by the NDLEA. The NDLEA prosecutor, Mr. Aernan, had informed the court that the convict, who sell meat at Odo-eran, Itire, Lagos, was arrested with the marijuana, while selling it to his clients. Aernan told court that the offence committed by the butcher is contrary to and punishable under section 11(c) of NDLEA Act Cap. N30, laws of the federation of Nigeria, 2004.